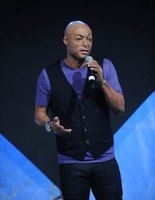 J.R. Martinez enlisted in the U.S. Army in 2002 and after basic and advanced training at Fort Benning, Georgia he became an Infantry man and soon answered the call of duty that saw his deployment to the Middle East in February 2003. Two months later, it was his turn to drive the Humvee as he was told by his colleagues; Martinez was driving during routine patrol in Iraq, when his driver’s side front tire hit an IED, the events that followed changed his life the way he never imagined. Born Jose Rene Martinez on June 14, 1983 in Shreveport, Louisiana to Maria Zavala; he is of Salvadoran and African-American descent. At nine years old, he moved with his mother to Hope, Arkansas and at 17 before his senior year in high school, he moved to Dalton, Georgia where he played strong safety for the Dalton High School Catamounts. Martinez had the dream of becoming a professional player however, an injury in his senior year, would later stand in his way of achieving that dream. 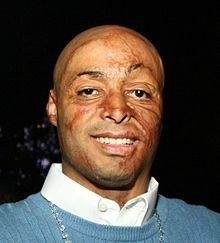 Martinez sustained severe burn to 40% of his body as a result of the IED incident of 2003 in Karbala Iraq; as a landmine detonated beneath his feet, fuel-fed flames seared his clothes and as he remained trapped in the Humvee, the thought of his life ending right there came to his mind. Martinez thought everything he ever wanted no longer exists as he felt pain in his face and numbness where flames had destroyed nerve endings; he thought it would have been better if he had not survived the incident. He had suffered some smoke inhalation and the months that followed marked a period of recovery and attempt to save his life. In all Martinez spent 2 ½ years in and out of hospital; military medics and doctors aggressively treated his injuries in Iraq, Ramstein AB, Germany, and later at the Army Medical Center in San Antonio, Texas where he underwent both cosmetic and skin graft surgeries. After seeing his face for the first time, he became depressed with uncertainty as to what would become of his life; however, Martinez did not allow his burns and look to derail his life for the second time. After speaking with his mother, he made up his mind to get through every single day irrespective of the challenges. He received answer to his wish to be of service to others when during his time in recovery, a nurse asked him to speak to another burn patient, who had just seen his body for the first time after surgeries and had become depressed. Martinez saw the patient and realized that encouraging him helped change his outlook. He decided to make regular visits to patients in the hospital and as a result, saw his own rebirth. After realizing the impact he had on others, he decided to use his experience to help others in hospitals sharing his story and listening to theirs. So far, he has been called upon by various groups, including corporations and veteran association to serve as a motivational speaker and encourage others going through like situations. He has been engaged in schools and has shared stage with other motivational speakers to bring solace and words of encouragement. Martinez currently serves as a member of the Board of Directors of the Phoenix Society for Burn Survivors. He was a featured speaker at the 2010 World Burn Congress and his work as a motivational speaker has generated attention all over the U.S. and beyond. In 2008 he was honored as a “shining star of perseverance” by the Will Return Council of Assurant Employee Benefits and in 2009 he was honored with the Veterans Leadership Award by the non-profit Iraq and Afghanistan Veterans of America (IAVA), as a result of his dedication to the nation’s generation of veterans. Martinez wanted to do more to encourage others in his situation and let them know their looks or situation should not be a barrier to their life aspirations. In 2008 he joined the cast of All My Children on ABC playing the role of Brot Monroe; his character was also reminiscent of his experience in Iraq, playing the role of a U.S. Army in Iraq injured in combat. He is the winner of season 13 of ABC dancing with the stars and since making his dancing debut, he has won over judges who have been impressed by his combination of strength, vulnerability and perseverance. On November 1, 2011 the Pasadena Tournament of Roses Association chose Martinez as the Grand Marshal of the 2012 Rose Parade. on December 24, 2012 just before Christmas, he appeared on Nancy Grace dancing with the star Christmas special on CNN HLN, where he once again talked about his story of resilience and experience on dancing with the stars. J.R. Martinez and his girlfriend Diana Gonzalez-Jones recently announced they are expecting a baby girl due spring 2012. Dr. Adeyemi Oshunrinade [E. JD] is an expert in general law, foreign relations and the United Nations. He is the author of ‘Murder of Diplomacy’ (2010) and ‘Wills Law and Contests’ (2011).